Share this comic with your friends and family pets! Let’s get a dialogue started! What other comics do you guys read? Are they appropriate for the classroom? I like Chainsawsuit, Gunshow, BugMartini, Buni, Formal Sweatpants, Merworks, Savage Chicken, I am Arg (not for the classroom), Amazing Super Powers, and Saturday Morning Breakfast Cereal! Cheers! I read; AmazingSuperPowers, Brawl in the Family, Questionable Content, The Oatmeal, Left-Handed Toons, Invisible Bread, Rock Paper Cynic, Drawing Board, Manly Guys Doing Manly Things, Robbie and Bobby, Loading Artist, Formal Sweatpants, Dangerously Scene, JL8, Vattu, and of course Time Trabble. Cyanide & Happiness, The Perry Bible Fellowship, The Oatmeal, My Cardboard Life. Out of all of those, only the last would be classroom appropriate. 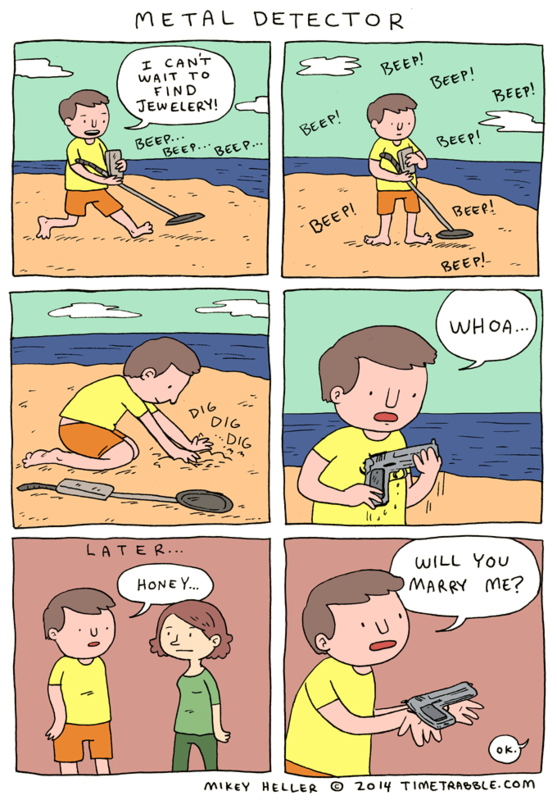 Awesome, cute and funny comic 🙂 Should try to blackmail her fiancee though for added funny approach of his metal detecting hobby. Paranatural, Monsterkind, Star Trip, Never Satisfied, Witchy, Headless Bliss, Starhammer, Cucumber Quest, Peritale, Parallax, Godslave, Oddity Woods, and there are some I’m still catching up on, like this one. Varying levels of appropriateness.